You might have received a notification shortly after making a successful transaction on GTBank 737 telling you the balance of your GTBnk's GTCoins. Then, you begin to wonder, is GTBank also launching a Coin? GTBank is not launching a Coin but it has created GTCoins as a way to reward customers after carrying out some selected transactions on their GTBank account. 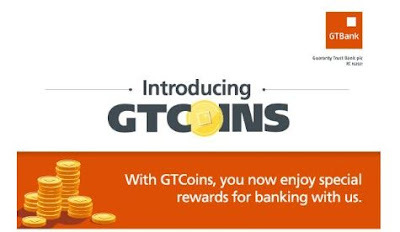 GTCoins are points that you earn as a GTBank customer when you carry out financial transactions using the bank’s e-channels, such as 737, our Mobile banking applications and Internet Banking. 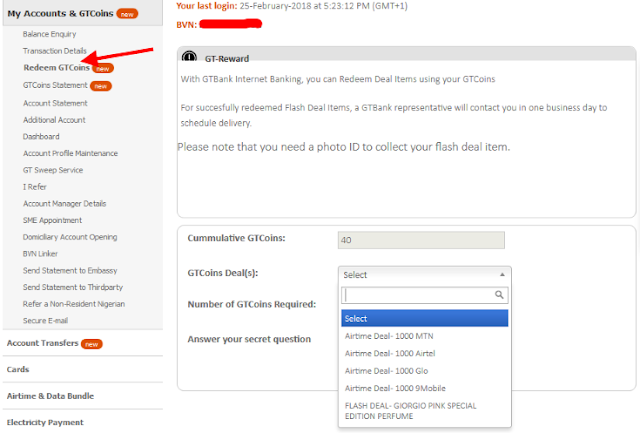 You also earn GTBnk's GTCoins when you open a new account, reactivate a dormant account or set up a standing instruction for your Child’s SKS account. The bank noted that GTCoins cannot be converted to cash or transferred to a third party, it can only be used to redeem deals offered by the bank. Buy airtime via 737, Internet Banking or Mobile Banking (5 GTCoins). Transfer funds to another bank via 737, Internet Banking or Mobile Banking (5 GTCoins). Bill payment on 737, Internet Banking and Mobile Banking (5 GTCoins). Naira MasterCard on any POS terminal in Nigeria or website (5 GTCoins). Standing Instruction on SKS account (10 GTCoins). Fund a newly opened or dormant account (10 GTCoins).You also lose GTCoins when you withdraw cash using other Banks’ ATMs. GTCoins cannot withdraw as cash, you only use it to load airtime directly to your phone, and it supports all network providers in Nigeria and probably other country. Before you can redeem your coin you need up to 200coins/points to load N1000 airtime. Though these might look so small but far better than when there was no reward attachment. There are two methods of checking your points, it can be checked through the internet banking using a browser or using 737 service code. It’s very easy and simple just as you normally check your balance, dial *737*99#, then choose 3 to check points and 4 to Redeem your points. Launch your browser and type in the address bar www.gtbank.com and log in to your account. On the left hand side you see My Accounts & GTCoins, scroll down and click on Redeem GTCoins. You will see your coins highlighted in the first box with your coin and you can also redeem your code if you have up enough coin. You can also check the statement of your GTreward or summary of your GTReward points, by click on the GTCoins Statement from your internet banking Dashboard. GTBank don’t need to persuade customers again like before when you enter the bank hall, they ask you what you want to do so that they can refer you to the 737 table, but now you do it willingly because of the reward attached, nice marketing strategy. The more you use GTBank e-channels for your transactions, the more GTCoins you earn.